Yesterday's giraffey-snake was removed very quickly and efficiently and replaced with some Stargazer Chrome Blue 233. This made me very happy. 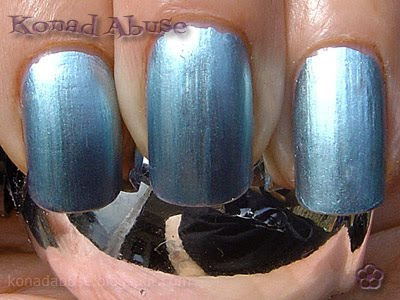 Stargazer Chrome Blue 233 Swatch. Well, hello there. I'm a bit loved-up with these Stargazer Chromes, they're not only brilliant for stamping but they look stunning all by themselves. I left these overnight before I got the urge to ruin the lovely, metallic finish with some stamping. The nails were stamped with the squiggly pattern on Konad plate m70 using some GCOCL blue stamping polish, which is a bit awful as it lacks opacity and dries so blooming fast and the patterns don't like transferring to the nail. They seem a bit rubbery, like acrylic paint, actually. 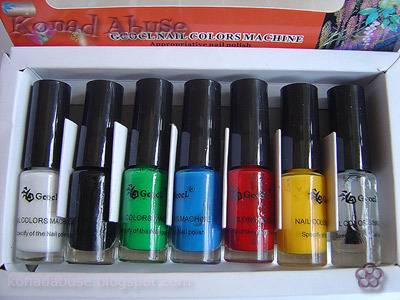 Quite disappointed with these GCOCL polishes, but they were colourful and dirt-cheap on Fleabay and I had to see what they would do. They'd be great over light colours if the polish would only transfer from stamper to nail a bit better. GCOCL Stamping Polishes. They're not much cop. Back to the stamping. There was an unfortunate incident and the corner of each nail was repainted with the Stargazer Blue Chrome, which looked really good so I sponged over these corners with some Stargazer Chrome Silver 232 and it looked a bit Joshiah Wedgewood. Squiggles, cover-up with some blue, sponge over with silver. An accent nail was needed as all those corners looked a bit empty. I was utterly determined to not use a skull, flower, butterfly or star design and went for the bats on Bundlemonster plate BM13 but the GCOCL polish did not want to play ball. So I had to settle for one of the butterflies on Konad plate m36 instead. Didn't want to use a butterly flip-flapping away, but I had no choice. This is one of those designs that look really good when you're short-sighted and it's a bit dark, but looks a bit rubbish and messy when captured in midday sunlight by a camera. Yes. Going to keep it on a couple of days if possible because, as I mentioned earlier, I'm well loved-up with these Stargazer Chromes, they're ace.